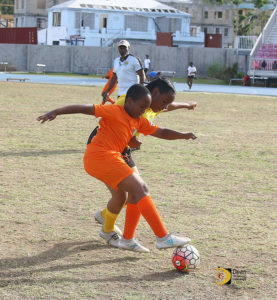 The BVI Football Association’s BDO Primary School League action continued. In the U7 League, Begrado Flax relied on Liam Munn to overcome Enid / Althea Scatliffe Red by a 1-0 score and Alexandrina Maduro Black drew 0-0 with AMPS Olive. In the U9’s Cedar School lost 1-2 to AMPS/Agape as Jaheim Bijai put the visitors ahead before Blake Kirk equalized for Cedar and then Elijah Maduro netted the winner. Kirk though had a much better result in the game against First Impressions as he scored all the goals for his team in a 4-0 victory. Robinson O’Neal drew 0-0 with ASPS Maroon. In U12 action, Cedar School hit Joyce Samuel for six with a hat trick from Dylan Kline, two from Ryan Lettsome and one from Oli Henderson. AMPS and Willard Wheatley/ Francis Lettsome drew 1-1, as Kymani Campbell cancelled out a 23rd minute penalty from Shajahni Deport. Elsewhere, Lewis Munn grabbed a hat trick for Cedar in their 5-0 romp over First Impressions, with Kline and Niki Haycraft also on the score sheet and BFEC beat JSPS 4-0 with Andres Bailey scoring twice, Joel Mars once and Jaden Abrams once.